Images of the spruce bark beetle, an affected tree, and a beetle larval gallery. Images from U.S. Forest Service. It’s hard to scan a forested hillside and see those dead spruce trees in among the green-leafed deciduous stands. 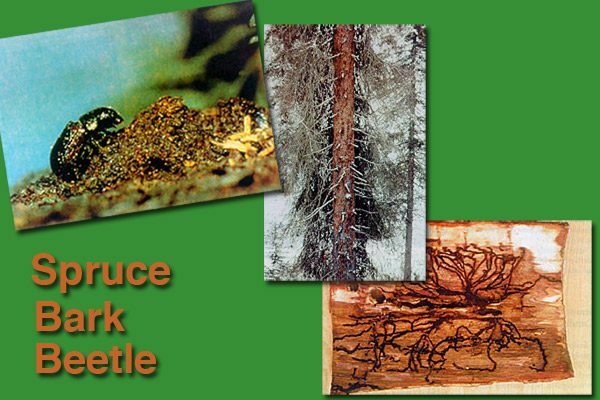 The U.S. Forest Service and the Alaska Division of Forestry have good information on their websites about the spruce bark beetle. We’ll share those resources, and speak with foresters about this pest’s life cycle, how widespread the reach is in Southcentral Alaska, and what advice they offer for the homeowner on how to protect their own trees. LIVE: Monday, August 13, 2018 at 2:00 p.m.
REPEAT: Monday, August 13, 2018 at 8:00 p.m.